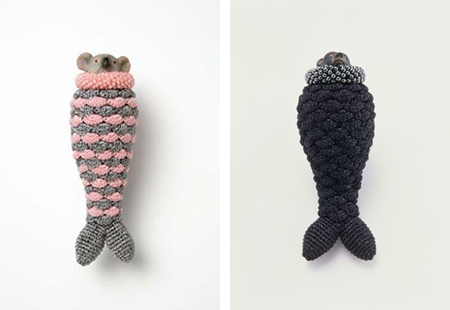 An emerging artist from Holland, who plays with animal, chasing, and knit at will. I felt like completely being lost. Wondering about what kind of world they live in. Maybe an artist’s mind is filled with stories. Her name is Felieke van der Leest. 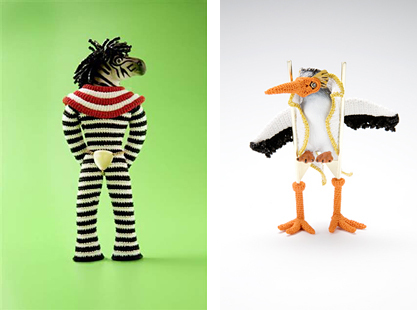 An emerging artist from Holland, who plays with animal, chasing, and knit at will. In November of this year, her 2nd Japanese exhibit “Animalia” was held at a contemporary jewelry gallery “Deax Poissons“. An artistic product with animal motif is a well-known recent wind as you know. An angelic animal proportion is a familiar innocent anonymous icon, and it could fill a gap between art and daily life quite simply. Felieke picks up a toy figure from a commercial catalogue of toymaker, and takes it to pieces and welds. It becomes a scarcity art piece after she dresses it gently hand-knitted garment. It was quite natural for her to become animal-otaku after she was born and raised near zoo where elephant and giraffe were carried by motor vehicles that her father owned. She still has a dream to move to Norway so that she can keep a horse. A figure is a detailed expressible playground for Felieke as such. She accompanies the story according to each feature. 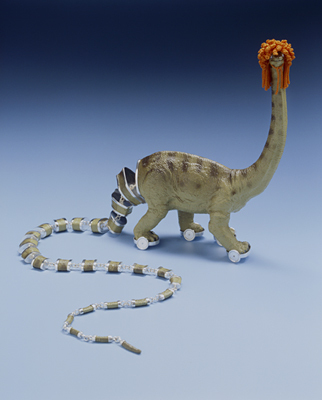 For example, this dinosaur called Diplodocus. Distinctively a slow runner. If so, have roller skate shoes on. Then a hairstyle should be a mullet in 80’s. If so… She keeps on grooving. 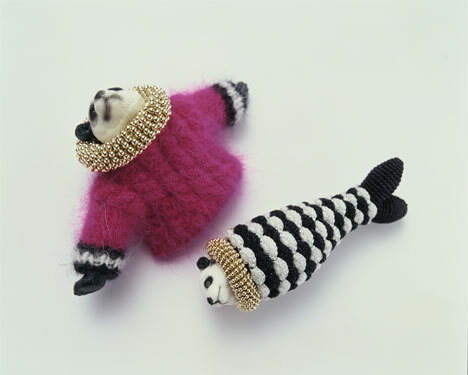 A panda mermaid “Pregnant Panda” with angora sweater is a homage to Coco Chanel, a zebra of moods “Super Freak Zebra” with Egyptian wall painting and super freak hairstyle, a short-man syndrome penguin “Rocky the Rockepenguin alias the Stork” that longs to extend its wings like Presley. A thought came up to me while enjoying the exhibit. Is this something we call a jewelry? A curator, Mr. Mori told me about it, “It is something you can live without, therefore, it shows your taste clearly.” That is certainly true. You smile at first sight, then start laughing when you hear the story. Her jewelry is an art piece you can wear that makes you happy.